Clayton Lake State Park is located 12 miles north of Clayton, close to New Mexico’s border with Colorado, Oklahoma and Texas. The landscape is characterized by rolling grasslands, volcanic rocks and sandstone bluffs. Set on the western edge of the Great Plains, it was a stopover point for travelers along the Cimarron Cutoff of the Santa Fe Trail. The park also features a Gold Credentialed International Dark Sky astronomy observatory. Visitors today can enjoy picnicking, camping, and superb fishing at the park’s 170-acre lake, as well as view one of the most extensive dinosaur trackways in North America. Clayton Lake was created by the State Game and Fish Department in 1955 as a fishing lake and winter waterfowl resting area. A dam was constructed across Seneca Creek, which is actually a series of seeps except after heavy rains. During the fishing season, which usually runs from March to October each year, the lake is a popular spot for anglers hoping to catch trout, catfish, bass and walleye. Boats are allowed on the lake, but are restricted to trolling speeds. The lake is closed to fishing during the winter, when it serves as a stopover for waterfowl. Several duck species including mallards, pin tails, and teals frequent the lake, and Canadian geese and bald eagles are often seen here. The park offers camping and picnicking facilities, a group shelter, and a modern comfort station. 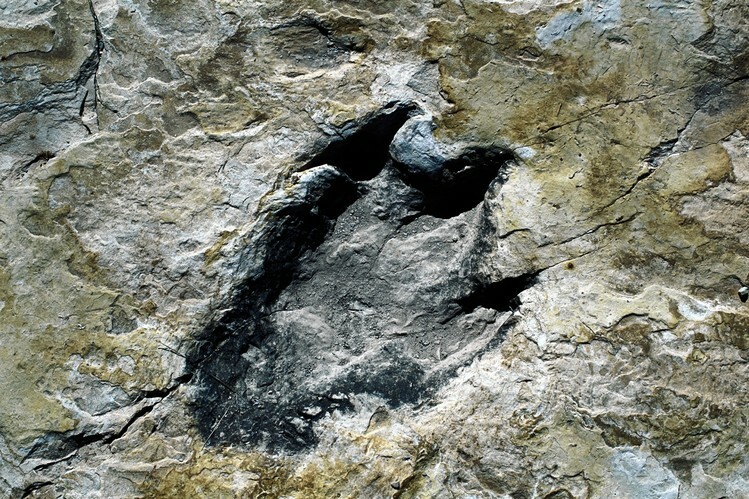 The dinosaur tracks are located on the dam spillway, at the end of a gentle half mile trail. Best times to view the tracks are in the morning and late afternoon. A sheltered gazebo and boardwalk trail along the trackway provide extensive information regarding the dinosaurs who traveled here so long ago. The Star Point Observatory opened in June 2006 and features a 12 x 16 foot building with a retractable roof that houses a computer operated telescope (12 inch Meade) and remote television monitor which allows for group viewing. The telescope and monitor is powered by a solar charged battery system. The astronomy club also has several additional 8 inch telescopes that its volunteers set up on concrete pads outside the building which allows other guests to observe selected targets in the sky too. The observatory is NM State Parks second to be constructed. An amazing aerial video shot by a drone over Clayton Lake State Park in New Mexico - Day 5 of the 2015 Dust Bowl Series. Enjoy!